It is October, so I can officially start blogging about Halloween, right? 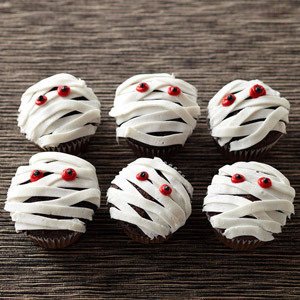 the adorable cupcakes below are super easy to make and would be a hit at any Halloween party! Start with frosted store-bought or homemade cupcakes. Use a pastry bag with basket-weave tip to pipe on white frosting. Pipe red frosting on for the mummy's eyes. Make two dots with black frosting to make the pupils. Yummy. Could use red hots for eyes too!